For one of the preschool days this year we focused on bugs, and this bug hunt was by far the star. The kids were able to work on colors, matching and different types of bugs. Here are the steps and supplies for the bug hunt. 1. Gather supplies, bug collecting jars, some bugs, some jars and a bug collecting kit. I used jars because the kids could put them in the jars. 2. 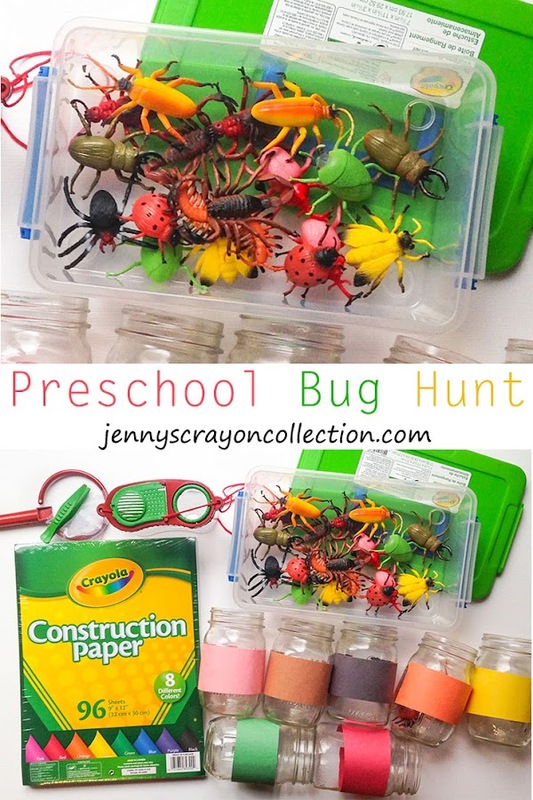 Label the jars with different colors of paper according to the color of bugs you have. I used colors so the kids could associate the colors with the bugs, since they do not read. I also did jars for the different types of bugs, one jar for flying bugs, and one jar for crawling bugs . 3. Hide the bugs and give each kid a bug collecting kit. 4. Let the kids hunt the bugs and then sort the bugs when they are done. 5. Repeat as many times as the kids want to repeat. We did this game over and over and over. They loved finding the bugs. So fun! My boys are older but I think they will still enjoy this activity.